RIO DE JANEIRO (AFP) - Usain Bolt roared into Olympic history on Sunday, capturing an unprecedented third consecutive 100m crown to confirm his place in the pantheon of the greatest athletes the world has ever seen. Bolt galloped away in celebration after a superb win, basking in the adulation of the stadium and even taking selfies with fans during his lap of honour. He then delighted the fans with his traditional "lightning bolt" pose as reggae blasted out of the stadium sound system. "It was brilliant. I didn't go so fast but I'm so happy I won. I told you guys I was going to do it," Bolt said. 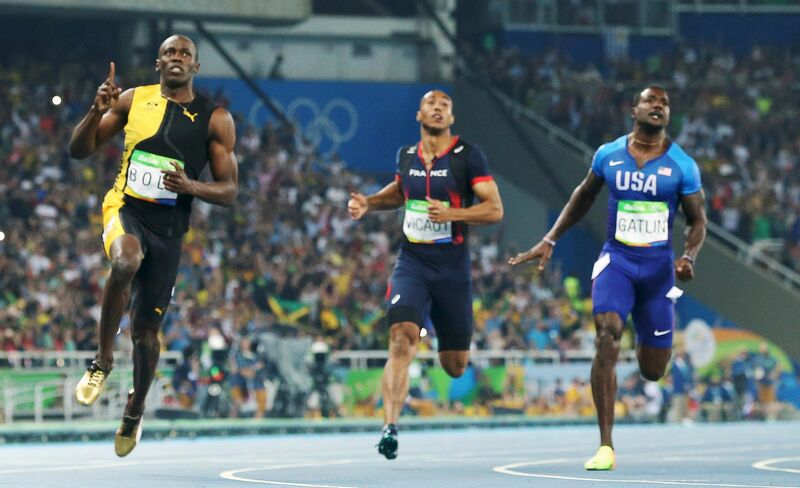 The victory left Bolt standing alone in the 120-year history of sprinting in the modern Olympic games. No other athlete - man or woman - has ever won three consecutive individual Olympic sprint titles. It also leaves Bolt on track to complete an incredible "triple-triple" of clinching 100m, 200m and 4x100m relay titles for a third consecutive Olympics. "Somebody said I can become immortal. Two more medals to go and I can sign off. Immortal," he said. But the Jamaican's latest triumph erases any lingering doubts that he deserves to be ranked alongside the likes of Muhammad Ali, Pele and Michael Jordan as the kind of once-in-a-generation athlete who transcend their sports. Bolt's win - his 18th gold in Olympic and World Championships since 2008 - averted what might have been a public relations disaster for the drug-tarnished world of track and field. A corruption scandal involving the sport's former rulers, who were accused of accepting bribes to cover up positive drug tests, and an investigation which alleged an elaborate state-sponsored doping system in Russia have plunged track and field into the worst crisis in its history. A gold medal for Gatlin on Sunday would have made uncomfortable viewing for many - world athletics chief Sebastian Coe among them - who have advocated that serial doping offenders should be banned for life. But those fears were swept away by the smiling, laughing figure of Bolt, for so long the sport's most charismatic showman. Gatlin, who has served two drug bans during his long career, made a powerful start to lead over the first 50 metres. However, as soon as Bolt's head came around the mid-point, the American was in trouble and the defending champion surged home around a metre clear of the field. Bolt later said he was dismayed by the reception given to Gatlin. "I was surprised by it - it was shocking the first time I heard booing in a stadium. However I just focused on my job and got it done," Bolt said. Gatlin meanwhile put a brave face on his defeat - the eighth out of nine meetings with Bolt. "At the age of 34, to race these young guys and still make the podium feels so good," said Gatlin, who would have become the oldest Olympic 100m champion in history had he won. "We work 365 days a year to be here for nine seconds," the 2004 gold medallist added.